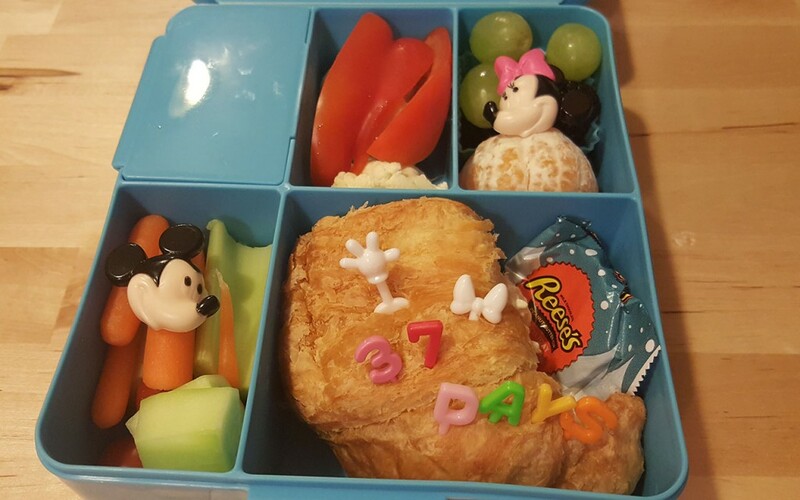 Over the last couple of years I have packed quite a few Disney themed lunches and several of those have included numbers counting down the days until our next trip to a Disney park. I have pictures of some of those lunches below. This first lunch was packed in our Planetbox Launch. I used a large cookie press from Disney Cakes and Sweets to make the sandwich and I included Mickey picks a friend got me at Tokyo Disney Resort. 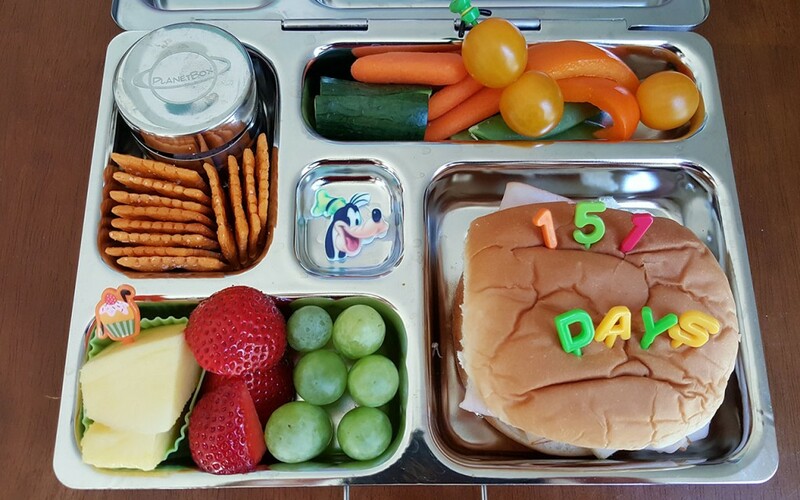 This next lunch was packed in our Planetbox Rover. It was Goofy themed with a Goofy hat pick from Tokyo Disney Resort, a Goofy cupcake pick, and a Goofy sugar piece that I bought when we visited a cake decorating store in Columbus, Ohio. I also used my number and letter picks to mark the number of days left in our countdown at the time. 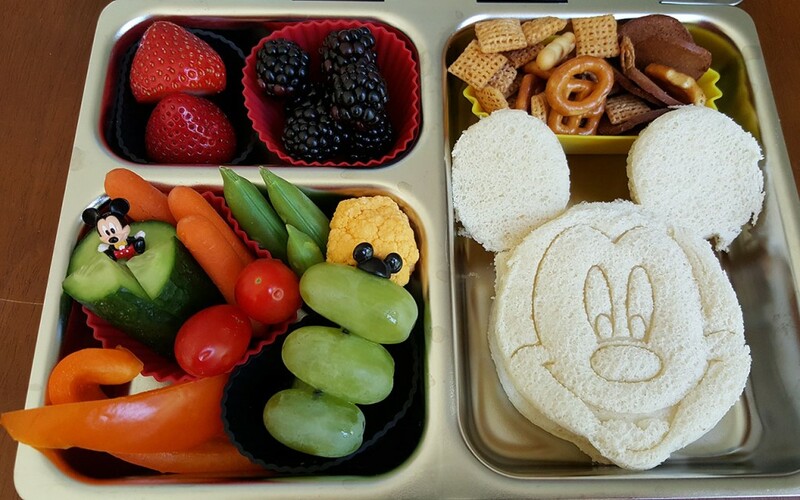 The next lunch was Minnie Mouse themed. 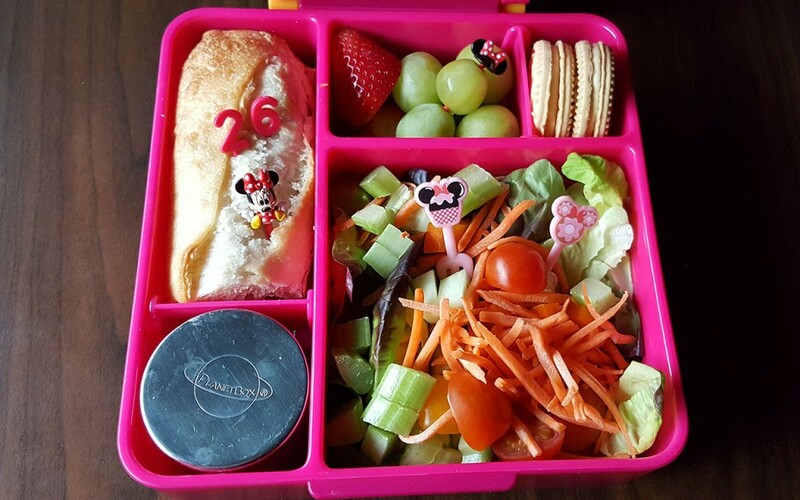 It was packed in our pink Omiebox and included numbers, and several Minnie Mouse picks. Our Planetbox lidded containers fit perfectly in these Omieboxes so I use those to include the salad dressing in lunches like this. I am sure I was super excited when the lunch below was packed – because the upcoming trip was only three days away at the time! 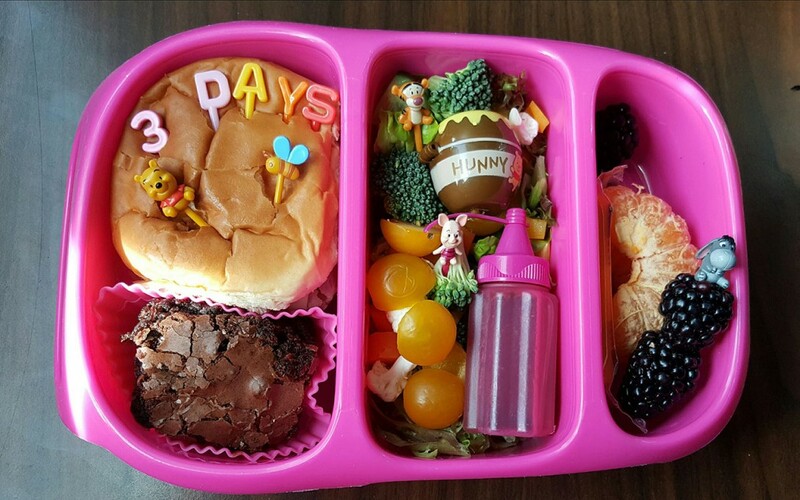 This lunch was packed in our pink Goodbyn box. It included Winnie the Pooh picks from Tokyo Disney Resort and a cute little “Hunny” container filled with sunflower seeds. Here, the salad dressing was packed in a Sistema bottle. 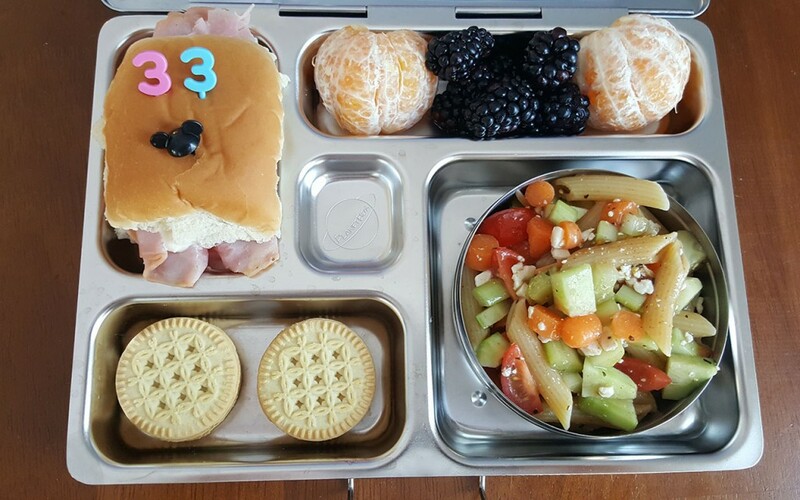 The lunch below was packed in our Planetbox Rover. It was simply marked with number picks and a Mickey ear hat pick. 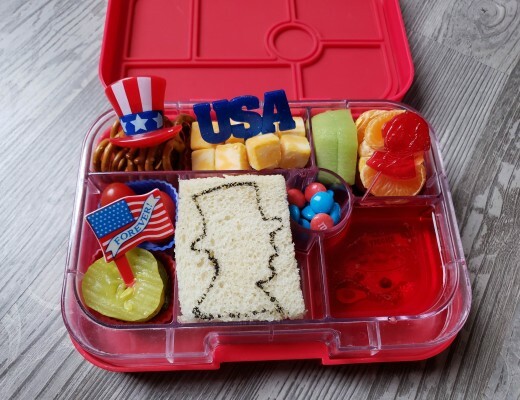 The lunch below was packed in a box from Pottery Barn Kids. It included some Mickey and Minnie mouse rings that can often be found in local grocery stores. I also included a Mickey glove pick, a Minnie bow, and numbers and letters for the countdown. 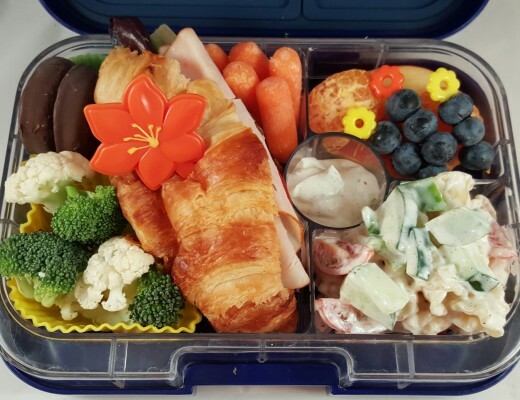 The final lunch of this post was packed in our blue Goodbyn box. 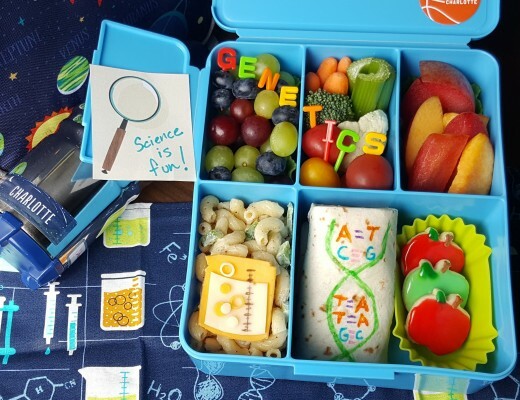 It included a napkin from one of my bento buddies, her products are listed in a Facebook group called Sew Chic, Geek Boutique. We have gotten a lot of use out of this napkin and have several other napkins and snack bags from her shop too. Her products are well made and wash well. Thanks for visiting my site and reading along. 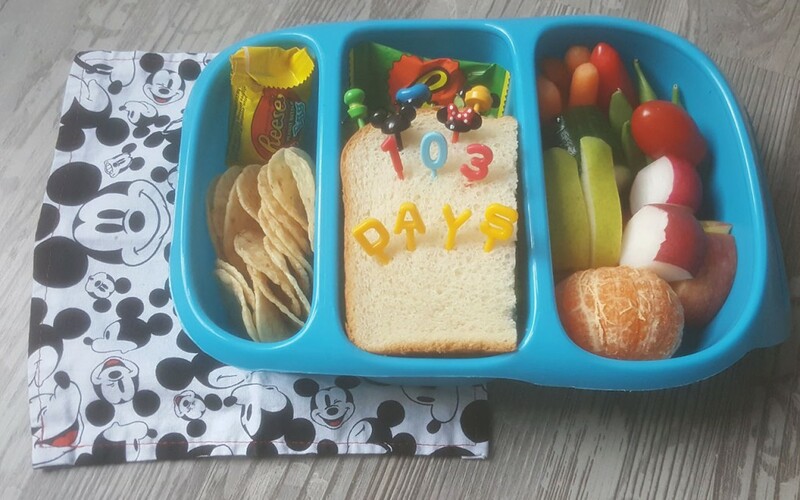 If you have something you are looking forward to, you might want to try a little countdown in your lunches too.